Most people wade, there are a few shorefishing spots, and some use small boats. This is one of the few times that I really don’t think the boaters have the upper hand. Between navigating the heavy current and the extremely shallow water, I just assume wade. Most use spinning gear, and a pole between 5 1/2 to 6 1/2 feet long with from 8 to 12 pound mono. If you use braid, it will often start to fray on all the rocks. The standard rig is a simple lead head and single tail grub. Weight varies and commonly it is thought to use the lightest weight you can that will still get you on the bottom. Tails vary in size also, 3″ to 4″ is standard. As for colors, every person you ask will have a different opinion. I will say this, there have been days where it doesn’t seem to matter at all and there have been days where one specific combination seems to work. Whether it’s fact or fiction, take a few different combos, but more importantly, pay attention to technique. The most important thing is to make sure you stay low enough, let the jig hit the bottom, then retrieve making contact with the bottom rather frequently. It’s almost like a jigging retrieve. Another setup is the carolina rig. At the original time that I wrote this page, the carolina rig was more of a novelty and finesse tactic that only a few people used. It has since gained in popularity, likely now that more people are using it than the traditional approach. With this, just use a floating head with your grub, make a leader ranging from 16″ to 36″, barrel swivel and egg sinker. This approach does have some distinct advantages such as keeping your jig in the perfect location once you have determined the correct leader length. Also, if you run your main line 2-4# heavier test than your leader, if you get snagged badly often breaking off will cost you only your leader. The fish you catch will largely be jacks (males), they are the first to show up and throughout the run they seem to feed more. Most of these fish will be 16 to 22 inches, however, you can catch some huge males. As for the females, they don’t seem to bite much pre spawn or during spawn, but post spawn they seem to feed a bit. Those individuals lucky enough to catch a female are often treated to a real trophy of a specimen. Many people will release the females and larger fish as they want to protect the fishery as well as prefer the smaller fish as table fare. I tend to agree with releasing the females, however, keeping a trophy is understandable. I do think it is highly unethical to cull fish for a stringer of only large females. A sure sign that the Walleye Run is starting to wind down is when you start encountering White Bass. If it’s late in the run and you feel like you are constantly missing strikes, try downsizing your jig/grub combo. Often this will be all it takes to find out that you are now fishing for White Bass. The White Bass Run has a somewhat loyal following in it’s own right, but overall you will see significantly less anglers. 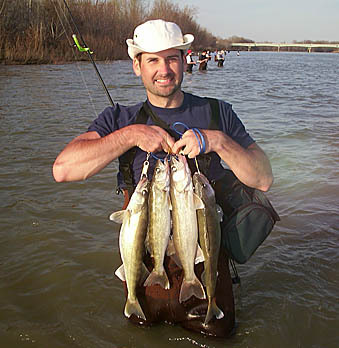 The only exception is downtown Fremont, Ohio, where the White Bass anglers quite possibly assemble in greater numbers than those targeting Walleye. I should note that many White Bass enthusiasts fish with live bait (minnows) over the jig/grub combo. After May 1st each year when the specific restrictions lift, many people opt for inline spinners or other multi hook lures. 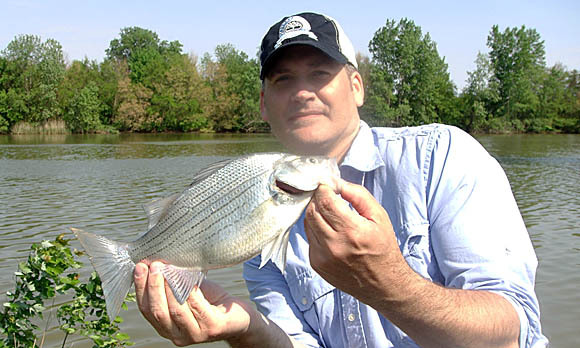 When the White Bass are in thick, it is often a situation where you can literally catch as many as you want. I’ve often watched people and just wanted to ask them, “just because you can catch hundreds of fish, should you?”. Spring is always a great time to fish and as a multi species angler it is a lot of fun. Along with the targeted species of Walleye and White Bass, I have caught Common Carp, Buffalo, Channel Catfish, Bullhead, Quillback, Longnose Gar, Large & Smallmouth Bass, various suckers and even Steelhead. It is likely I am even forgetting a few others. In all honesty, my favorite days are not the ones where I just head to the water and get my limit of Walleye. 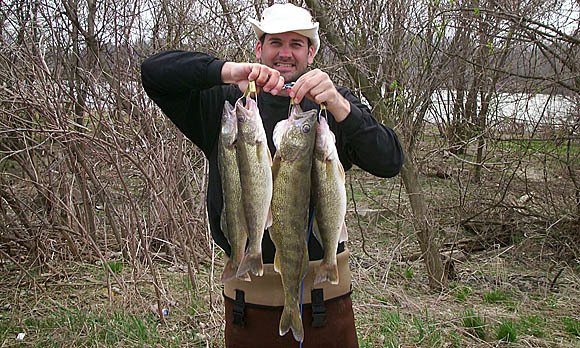 I actually have had the most fun when it is the transition period and I get some Walleye, some White Bass and the mixed bag of bonus fish that includes about anything with fins. I hope I made a good case for trying the Walleye Run if you have never done it. If you are a seasoned veteran or someone who fishes it yearly, I hope I provided something in the content that’s of use. I also hope I didn’t sound like I was lecturing or that I consider myself to be the best expert on the topic. I have a good deal of success fishing it, and simply wanted to share my thoughts. I do get asked about guiding, I’m pretty informal and just will try to coordinate being on the water at the same time and place. Email me at coolwaterfish@yahoo.com.